And once I got going, I just couldn't stop! Looks like I'll be a busy gal once this cold clears up and most of it seems to be lots of deep cleaning - no surprise there. I definitely am not the best of housekeepers. Hopefully this will get the fire fueled and then I can get back to my weekly cleaning schedule. Luckily I'm not expected to get it all done this month, but rather it's a list of goals to refer back to throughout the year. Totally manageable. 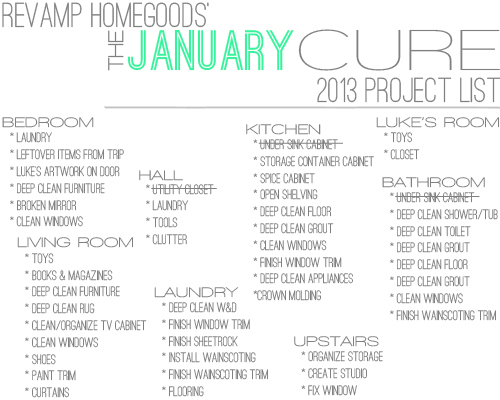 Any of you out there taking part in the January Cure? Is your list as out of control as mine is?